Bridge-Style Power kit consists of Power Inlet & Power Outlet and there’s electrical wire that runs between inlet & outlet in the wall to “Bridge” the power. Power inlet plugs into an existing electrical outlet that’s already in your home to energize the Power Outlet portion of the Bridge-Style Power Kit. 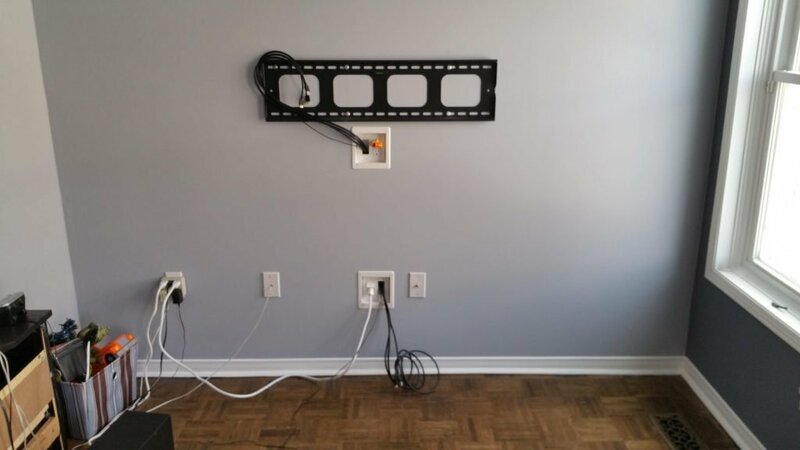 Bridge-Style Power Kit (AKA Power Bridge) is a great alternative if you don’t already have an electrical outlet installed, dedicated for your wall mounted TV. Any “Flexible Power Cords” such as TV Power cord or Sound Bar Power cord or Power Extension cords are NOT low-voltage wires. So they cannot be buried in walls or ceilings as it’s against the building code because it’s considered as fire hazard. In short, the only way to hide the TV power cord is to plug it into a power outlet behind the TV. Only “low-voltage” wires such as HDMI cables, Coax cables, Speaker wires or any other Audio / Video cables with FT4 or FT6 in-wall approved fire rating can be hidden inside walls or ceilings by building code. Installing a new electrical outlet requires getting a permit and the work can only be done by a licensed electrician and inspection is also required after installing a new electrical outlet. So this can be costly. Some cities allow home owner to install their own electrical outlet but still requires both permit and inspection regardless. You can call your city to find out whether or not the home owner is allowed to install an electrical outlet if you’re handy & knowledgeable enough to do so. Installing power bridge kit does not involve tapping into your existing electrical wiring/circuit. Therefore, electrician is not required to install power bridge. Which means less money spent out of your pocket. Only the Power bridge INLET & OUTLET are connected with an actual electrical wire (NOT a power cord) inside the wall. 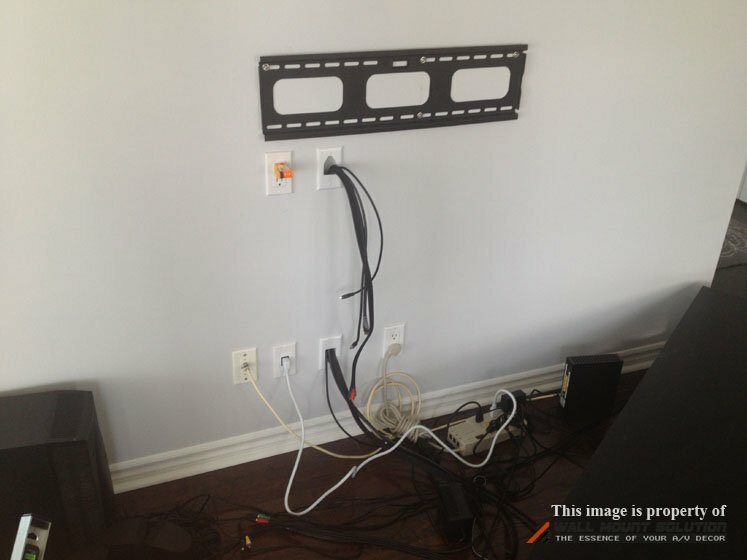 So this is a building code compliant solution to hide the power cord of your wall mounted TV in a cost effective way. You can protect your expensive TV by plugging the power bridge into UPS (Uninterruptible Power Supply) or Power Conditioner or high-quality Surge Protector in case if there’s a jolt or sudden power outage. 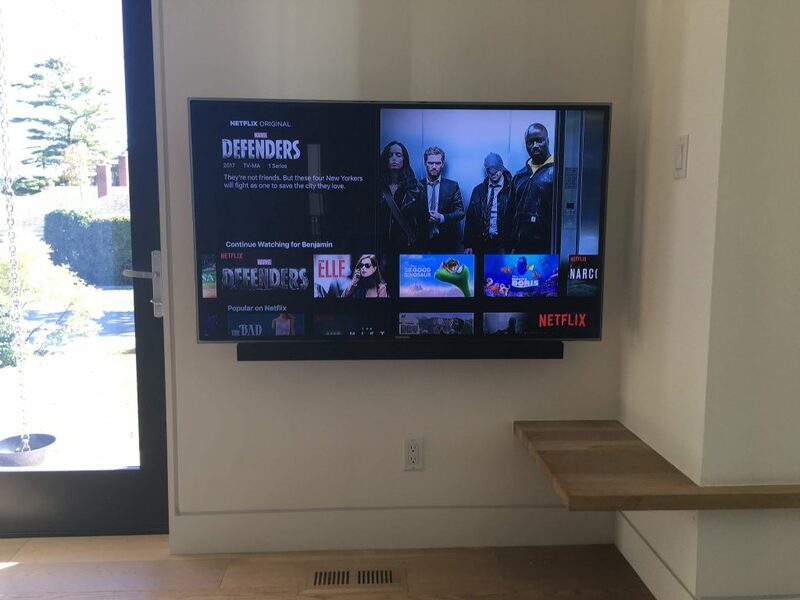 If you plan to put a component stand / entertainment unit that will sit below the TV then it’ll be ideal to install a bridge-style power kit. That way your component stand can hide the power inlet. Component Stand Hiding the Power Inlet & Cables coming out of the wall. 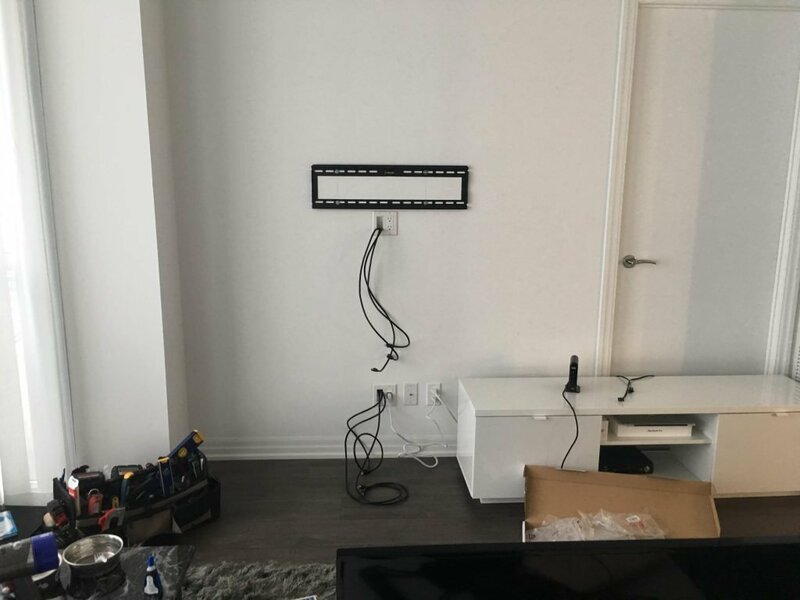 It’s also ideal for installation above fireplace if you plan to run HDMI cables as well to an area where you will place your components on a component stand sitting next to the fireplace or other designated area. Picture below illustrates a Bridge-Style Power kit Outlet installed over the fireplace and inlet on the side of the fireplace. 2 HDMI cables are also fished through coming out at each end of the bridge style power kit. 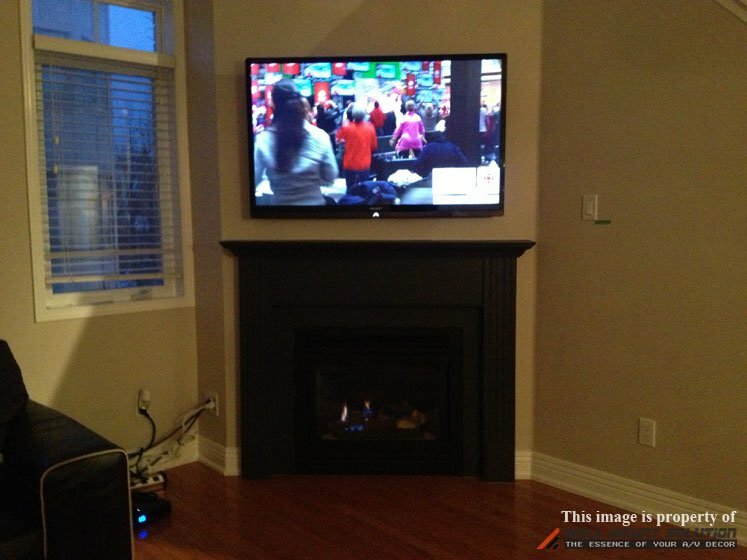 Picture below shows the TV mounted over fireplace with wires concealed using Bridge-Style Power kit. There will be a component stand placed on the left side of the fireplace where the components are. If you don’t plan on putting a component stand below the TV then the Power Inlet will remain visible. 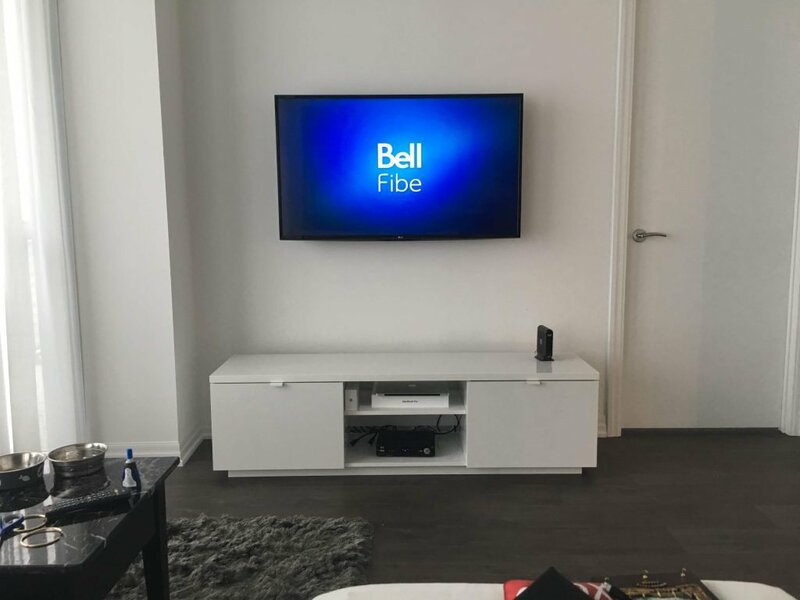 One of the most common examples of these situations include having a Smart TV mounted on the wall and NOT having any components connected to the TV where you don’t need to run any HDMI cables. In this situation, having a Power Outlet installed behind the TV will be the cleanest solution. 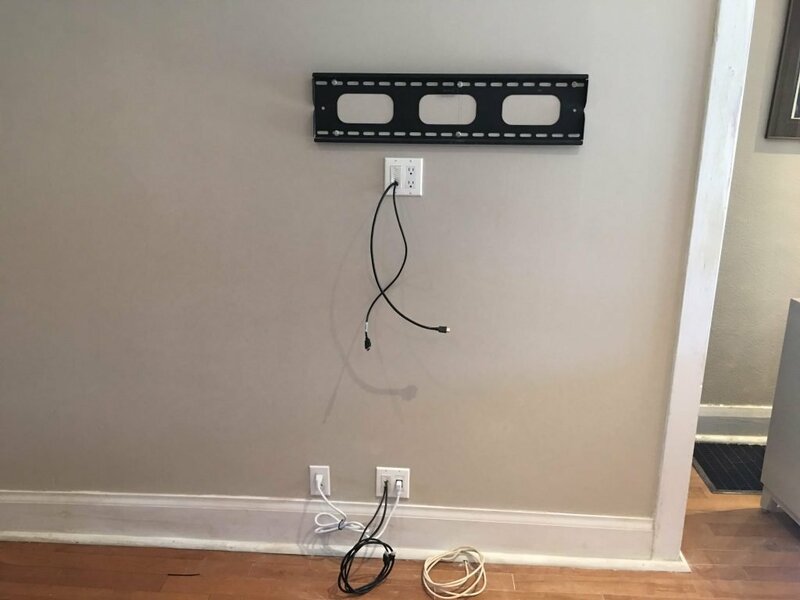 Alternatively, you can also consider using wire raceway / wire cover to hide the power cord and plug it into the nearest power outlet to the TV. There are ones that are same size as a regular electrical outlet in a single gang design that fits with a single gang decora wall plate. And there are ones that are double gang in size that comes with low-voltage wire pass-through port. Also there are power bridge kits that are larger in overall size horizontally and vertically. 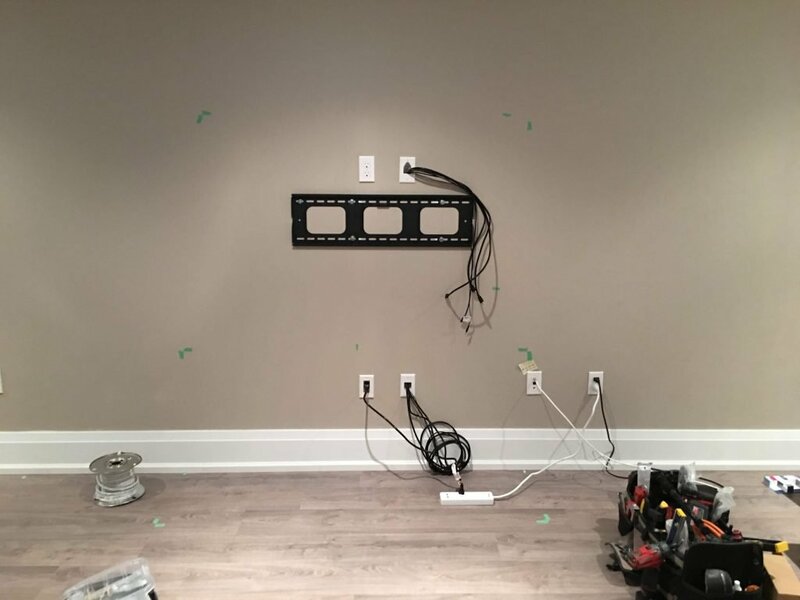 Some power bridge kits are recessed so you can have your TV mounted almost flush to the wall and you can put your component stand right up against the wall. All bridge-style power kits (or power bridge) have one thing in common. All Bridge-style power kits consist of 2 main parts; Power Outlet & Power Inlet. And Outlet & Inlet are “bridged” by UL certified 14/2, 3 conductor electrical wire inside the wall – hence the term “Bridge-Style Power Kit”. 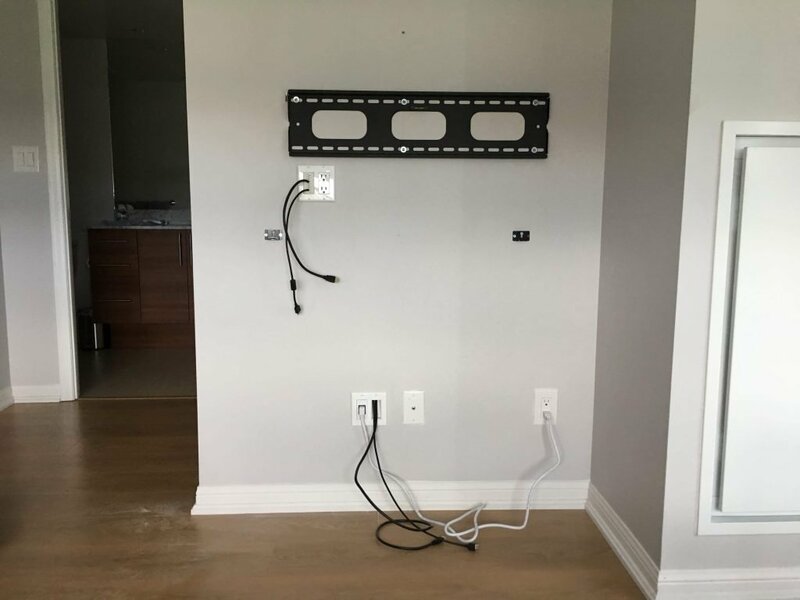 Power Outlet is the portion that would be installed behind the TV. And the Power Inlet is the portion that would be installed below the TV, somewhere behind a component stand (usually at the same height as other standard wall outlets/jacks). 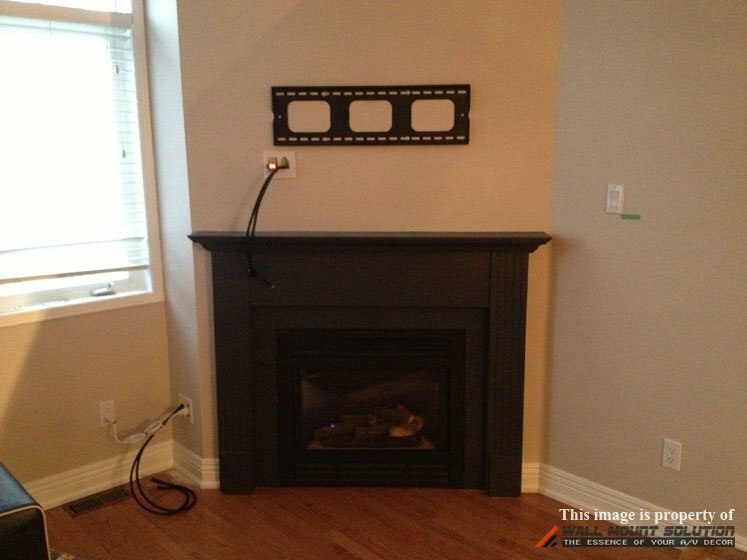 So, what are your options in order to supply the power behind the TV to hide the power cord? Option 1: Install a new electrical outlet behind the TV. Ideally, you would get the power from the nearest existing electrical power source that has enough amperage to jump from so you don’t overload a circuit. So, even if you have an existing power outlet nearby, but if there’s not enough amperage, you’d have to get the power from elsewhere where there’s enough amperage. That said, if jumping power from the nearest power source is not an option, you may have to go straight to the electrical panel. And there’s a very good chance that you might have to cut drywall in several places wherever necessary to go through studs or joists in order to fish the electrical wire. And the right way of doing this is to get the permit from the city, hire an electrician to install a new power outlet and then get it inspected afterwards. After that’s done, you have to deal with drywall patching/compounding, sanding then more drywall compounding then sanding again and then painting your wall. It’s not the best suitable option for everyone. And this can be costly. 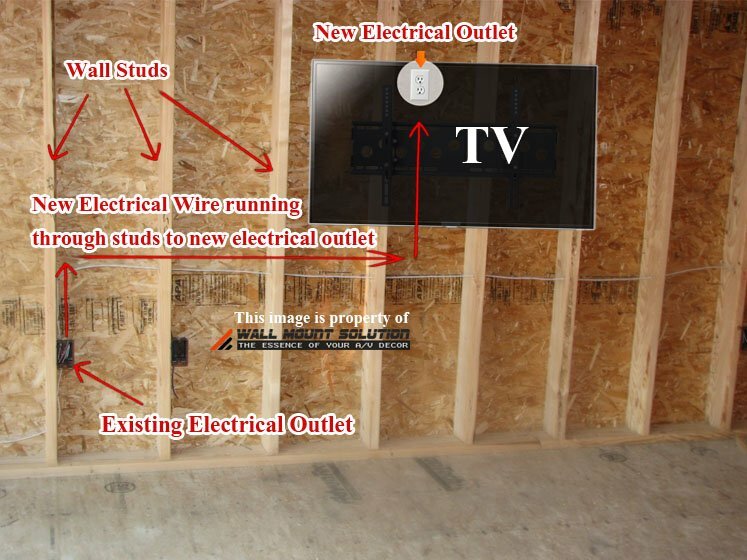 Illustration below shows an example of the electrical wiring path to jump from the existing outlet (given it had enough amperage) but still having to go through the wall horizontally across to feed the electrical wire through the studs. Option 2: Install a Bridge-Style Power kit & Forget-about-it. You can simply install a Bridge-Style Power kit. These kits do not tap into your home’s electrical circuit internally. It’s kind of like having a power extension cord between the power outlet and power inlet but it meets the building code because it’s actually an UL certified 14/2 copper electrical wire (meets building code), NOT a flexible power cord (against the building code). 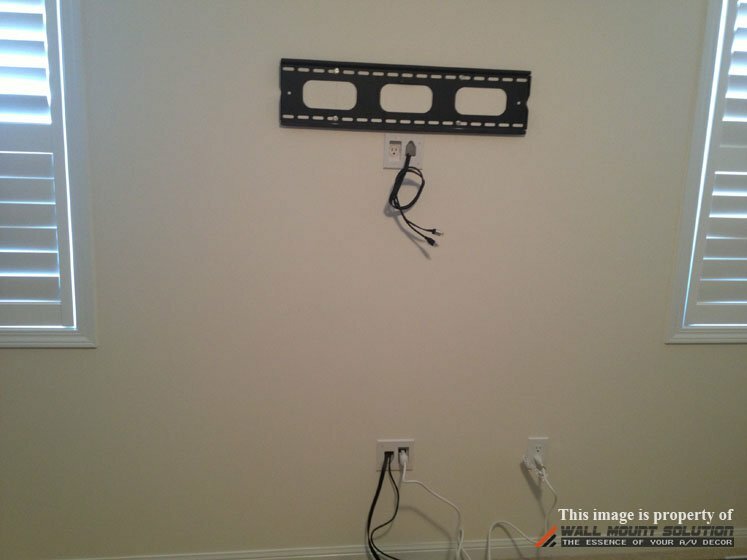 This is the most cost effective option to hide the power cord for your wall mounted TV. Bridge-Style Power kit inlet can plug right into your existing electrical outlet nearby or it can plug into your surge protector.